Think there were too many characters turning into flaky bits and floating off into the sky in the Battle of Hogwarts? 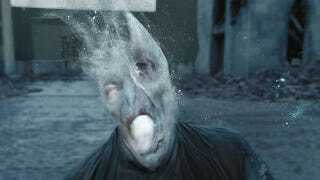 Concept artist Andrei Riabovitchev has released some stills from Harry Potter and the Deathly Hallows: Part 2 that show a slightly different Voldemort departure. Plus, check out a few close-up shots of some giants!